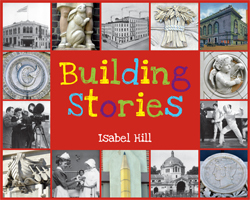 Building Stories by Isabel Hill, is a beautiful and educational book that not only captures the interest of children but also adults. The book displays images and captions that help children to start to notice and understand the symbolic meaning and value of art that is displayed on public buildings. Isabel Hill writes, “Building are like books with stories that last. They tell us about our present and also our past.” This is a great quote to ponder on as an adult when passing by public buildings. A statue to the naked eye is just a statue but look closer you can see what story the artist is telling to tell. Art of a building will help you understand its past, present, and the future it may hold. Knowing this as an adult, can allow a parent to have in depth and educational stimulating conversations with their child (ren) on the beauty of art and it’s story. The end of the book gives interesting facts that pertain to the recent pictures and captions that were displayed earlier in the book. They allow a parent or a child educated past late elementary to gather more information and build more of a story on those buildings. This book displays creativity and encourages creativity from its readers. As a parent and educator, I feel this book is remarkable to a wide span of age groups.